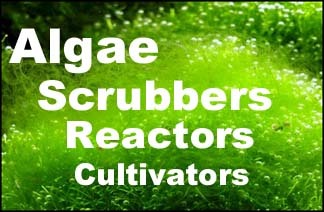 A few photos of one of my experimental algae scrubbers... A non-floating SURF-style algae scrubber in the works. * Designed to be in-sump, over the water surface. * Water exits through the pipe-work. (water inlet not constructed yet). * Removable dual chamber for algae growth. * LED-lights not constructed yet, (maybe SM GEM5 prototypes). * Lots of strings for fast re-growth after harvest. I think it needs less strings. If too many, the self-shading becomes the primary limitation. The four GEM5 lights will be a good start; they will drop right in.